Oh, Monday, how glad I am to see you! It was a very difficult weekend here. On Friday I joined the Five Minute Friday crowd and wrote about joy. Little did I know, that night I would be given the opportunity to fight for joy and live what I had just written. I had a hard time falling asleep and staying asleep on Friday night. My autonomic nervous system was going wild. My heart rate wouldn’t slow down. My blood pressure was nearly non-existent. Eventually I was up with one of the worst gastroparesis flares I have had. I’ll spare you all the graphic details, but let’s just say that throwing up while almost fainting is scary and really hard to do. I got little sleep that night due to pain and a heart that kept racing. I was exhausted and physically felt miserable. My Friday post came to mind, and as I lay in bed I was reminded to fight for joy on that very hard night. I am happy to say that I made it through the night, and I fought for joy with all I had! On Saturday Will took me to the ER for IV fluids. I was dehydrated and was given 2 liters of fluids. I had the sweetest nurse and doctor to help me, so that was a bonus! On Sunday my stomach still wasn’t emptying well, and we went back to the hospital for two more liters of fluids. The fun side to all of this is that I got out of the house for the first time in over a month! And not just once – I got out two days in a row! I rolled into the hospital with my stylish wheelchair and light up wheels, and I joked with my friends that I have a rocking social life! Today I am able to drink fluids and eat soft and liquid foods again. I'm still extra weak, but I am doing so much better than I was yesterday. This weekend was hard, but it was also a good opportunity for me to choose joy even on the hard days. Dear Rachel so thankful you are doing better! 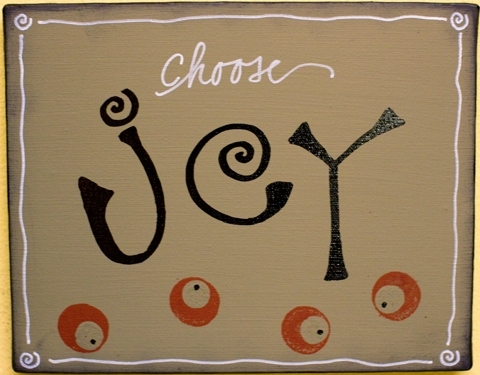 Your story blesses me to see how much God is working in your life, giving you strength to choose joy. Praying for you! <3 I haven't been very good at this latily, I haven't been finding joy in my waiting for an important appointment. I'm trying to find purpose but mostly I get frustrated because I feel like it'll never get here. Btw, I got out my knitting needles today to start a scarf as hand therapy :) have you ever tried loom knitting? I'm sorry, Tonya. We are sisters in suffering - miles apart, but close in heart! I will be praying for you as you fight for joy. It is hard. I hope that your important appointment will go well and that the wait will be worth it. Thank you, Helen! I am grateful for your prayers. I just found your blog and it has blessed me as I lay in bed reading tonight. I also have gastroparesis. Thank you for sharing your life. Thanks for stopping by to read! It is so nice to meet you. I'm sorry that you have gastroparesis. I hope that you will find some encouragement here. You are welcome to read and chat here anytime!